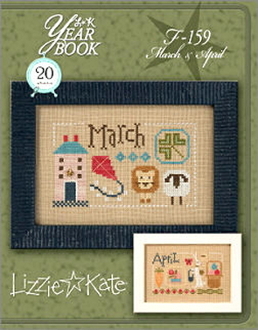 Two lovely designs featuring an adorable "March" scene with a Lion, Lamb, Kite. "April" features an Easter bunny with a basket of eggs and flowers. Part of Lizzie Kate's Yearbook Double Flip series. Chart includes a Butterfly and Shamrock charm. Design sizes: 5" x 3". Model stitched 2 over 2 on 28 count Light Mocha Cashel Linen (not included). Stitch count: 69w x 41h. Instructions given for Weeks Dye Works threads with conversions given for DMC embroidery floss (not included). Copyright © 2012-2019 Thread-The-Needle. All rights reserved.